Last week, in honor of Banned Books Week, I read Looking for Alaska by John Green. It was one of the books that made it onto the list of top challenged books in 2012 -- number 7 on the list. As my long-time readers will know (if I still have any after my long silences), I read a challenged book, usually from the previous year's list, every year during Banned Books Week. I had read a lot of what was on the list for 2012, so I didn't have very many to choose from if I wanted to read something new. Is it literature's responsibility to teach morals? As it happens every year, I found out that it was Banned Books Week this year when I spotted an article about it. It's usually NPR that I find out through, and this year the article was Banned Romance: What's So Bad About Happily Ever After? If you are looking for a book to read to celebrate Banned Books Week, here are some other resources to help you with your search. Every year Banned Books Week sneaks up on me -- usually I find out mid-week, when it's almost too late to read a challenged book in celebration. This year I got lucky: This morning I happened to see a headline mentioning it today, the first day of Banned Books Week. Yes, it's already that time again! After reading The Vampyre by John Polidori, I was pleasantly surprised by Carmilla. This is another piece of early vampire literature -- predating Dracula, which is often considered the father of the genre -- which I decided to read as part of my research for the vampire series I am currently writing. Unlike The Vampyre, however, it was told in a friendly, conversational narrative by the main character, Laura, who is being preyed upon (without her knowledge) by the vampire Carmilla. As part of my research for the vampire series I am writing, I decided to read some classic vampire literature. The first on my list was John Polidori's The Vampyre, which is a fairly short tale about a man who unwittingly befriends a vampire, resulting in the death of several women close to him. I got the ebook of Hunt at the Well of Eternity for free quite some time ago, shortly after I started on my digital reading journey in fact. Back then there was a free category in Barnes & Noble's ebook store that I would check regularly, and I downloaded this during that time. A year or two ago, I also bought and downloaded the other five books in the series, since the publisher was reportedly going out of business and the ebooks would no longer be available once that happened. Get The Da Vinci Code for free! The ebook version of Dan Brown's The Da Vinci Code is currently free to promote his next book, Inferno, coming out in May. The ebook of Da Vinci Code also has a short (10-page) excerpt of Inferno. This is a fantastic deal -- you rarely ever see big sellers like this offered for free! Supposedly you'll find the free price at all the major retailers -- I downloaded my copy from Barnes & Noble, and I know it's free on Kindle, too. Don't hesitate to download this one ASAP -- no telling for how long it will be free! I have gotten a little behind on my daily book posts lately, partly because of how busy I've been with other things, such as my horses and the novel I am working on. I'm still reading Les Miserables, which you'll remember was on my list of books to read in 2013, so all of these daily posts are actually catch-up reviews of books I read last year but forgot to blog about. His Mistress by Christmas was a holiday romance about a widow who is looking for someone to have an affair with -- she doesn't want to give up the independence she has thoroughly enjoyed since her husband died. Her choice of a lover, on the other hand, is more interested in marriage than she is. I bought this inexpensive ebook early on when I was researching the 1920s for my novels. In retrospect, I could have saved my money, even though I did pull a couple of useful facts out of the book. It was just too short, with too little (and too generalized) information -- it was essentially the Cliff Notes of history books, although I didn't know it at the time. It might be a good source of information for someone in middle school or high school who is doing research for a project, but for anything more, it just doesn't give enough information. Short books equal short reviews I am afraid, so that's all I have to say about this one! Since I'm a bit of a 1920s nut -- I have a blog about my 1920s-themed wedding, and I'm writing a series of novels about vampires in the 1920s -- I was thrilled to see a story on NPR about The Scrapbook of Frankie Pratt. It's described as "a novel in pictures," and the NPR story says that Preston bought old images from more than 300 eBay sellers in order to illustrate her novel. This is incredibly interesting to me, since I've been using 1920s French photo postcards as representations of my characters, and as images for my website and (future) book covers. I got this ebook for free a while back, but because of my occupation as a nanny and a babysitter, I was very interested in the message. A lot of the parents I work for spoil their kids without even knowing it, just by giving in to their whining and crying, and otherwise rewarding bad behavior. I can't believe I never blogged about Trapped! I had had it on my wish list, but I finally bought and started reading it during a big snowstorm we had -- last winter, I guess it was. I was thinking we would get snowed in, and decided to read a book to match! I was a big Anne Rice fan when I was in high school, so when The Wolf Gift came out last year, I jumped on it. Having done vampires and witches, Anne Rice is now doing werewolves! It seems to be the trend in vampire fiction lately, that you can't just do one kind of supe -- the more the merrier, especially if they are all in the same book (Sookie Stackhouse comes to mind). Just the other day there was an article on NPR about the kids' book club choice of the month, The Wonderful Wizard of Oz. (I didn't even know that there was a kids' book club at NPR, but apparently they are called the Backseat Bookclub.) I am thinking about reading this book in March along with the book club -- I've always meant to read it, but have never gotten around to doing so. Happy Read an eBook week! I had a busy weekend, so I actually missed the first day of this -- Read an eBook Week started yesterday (March 3-9). But even though I'm a little late to the party, I love Read an eBook Week -- not only do I feel proud to be part of the movement they are trying to promote (moving to digital), but there are also great deals to be had on ebooks during this week, from publishers as well as indie authors. After reviewing several thrillers -- two of which, Still Missing and Dark Places, I read right in a row (Gone Girl I read months ago) -- I decided to take a break and review a few other sorts of books while I read Les Miserables. Young Al Capone was a biography I read as part of the research for a series of novels I am writing, which take place in 1920s Chicago. Although much of this book was about the years before Capone moved to Chicago, it still looked like it would be full of information for my novels -- which, of course, it was. My husband and I are both big Lord of the Rings fans, and since we hadn't been to see The Hobbit yet (Michael doesn't like big movie crowds), I decided to take the time to reread the book first. I first read The Hobbit four years ago. Even though I read The Lord of the Rings for the first time shortly after high school, and even though I'd read those books several more times and loved the movies, I hadn't ever read The Hobbit until 2009. Should e-readers track our reading habits? E-Readers Track How We Read, But Is The Data Useful To Authors? The story is about how e-readers track information about their readers, and not just what books they buy: also how fast they read, how far they get into a book, and so on. This is relatively new territory, since publishers couldn't track this kind of information with paper books, but it's also rather controversial. There is always an outcry about any attempt to gather information about our habits, and this is no different. I actually read the short story that Total Recall was based on (originally published as "We Can Remember It for You Wholesale" -- I can see why they changed it!) months ago, when the ebook was offered at a discounted price to coincide with the release of the new movie. But since my husband and I finally saw the new movie recently, I have been thinking about the short story, and decided to reread it. For several years now, libraries have offered the ability to check out ebooks as part of their services -- and for many libraries, like mine, their ebook collections are growing steadily, if not rapidly. There is a pretty high demand for ebooks at the library, surprising considering how slow many people were to accept the digitalization of books. This library will have nothing but digital media. Patrons who don't have e-readers of their own can use the library's e-readers and computers to read ebooks in the building, or check out pre-loaded e-readers to take home. Of course, I am sure there will be a high demand for those devices, but at least the library is finding a way to cater to people who cannot afford the technology. The trade-off is that the library is not only able to save money on space (books take up a lot of real estate), but they will also have more space for computer stations and reading areas -- the idea of which I love. It would be weird not to see any books, I think, but at the same time I often find that libraries and bookstores have a shortage of good places to sit and read. Is the paperless library the future? I certainly think so (though I don't necessarily want it to have the cold discomfort of an Apple store, as this article suggests it will). I would make it more cozy, personally, since I think that's what most readers want, regardless of the format in which they read! But I really like the idea of the library's space being devoted to computer stations and comfortable reading nooks. I've had The Scorpio Races in my to-read list since it first came out, since I loved Maggie Stiefvater's other books so much: Shiver, Linger, and Forever, a YA trilogy that features a unique take on werewolves. Of course a book about fantastical horses caught my interest (I love horses and have two of my own), but, sadly, it still took me a while to get around to reading this book. My wish list is most definitely bigger than my free time. The Princess Bride was our sci-fi/fantasy book club's selection for January -- we are reading a few classics of the genre this year, and this is one of the ones we picked. Most likely everyone has seen the movie, which is not just a classic, but also a childhood staple; the book isn't as widely known, but it is still a landmark classic in the fantasy genre. Lyra's Oxford is not really a book, even though it's sold as one. 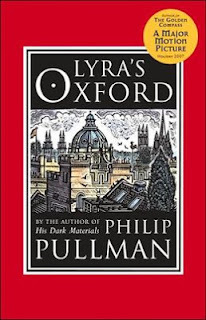 It's actually a short story about Lyra after she has returned to Oxford, plus some bonus materials that fans of the His Dark Materials trilogy may find interesting. The story, however, is nice if you left the trilogy wanting more, and wishing to know what happened to Lyra after the end of The Amber Spyglass. I actually finished The Amber Spyglass days ago, but I've been quite busy (not to mention sick yesterday) and neglected to blog about it until now. But I actually found this book to be better, in many ways, in rereading it -- I'm not sure I understood as well what was going on the first time, and I certainly didn't remember the events in the book as well as I thought I did. Warning: Spoilers follow. Read on at your own risk! The Subtle Knife is the second installment in Philip Pullman's His Dark Materials trilogy. The first in the trilogy, The Golden Compass, I decided to reread recently when the girl I nanny for started reading it. She hasn't yet gotten to The Subtle Knife, but I have found that this trilogy is not an easy one to read any other way than straight through, so that's what I did. I seem to be on a run of children's books lately, so I might as well review what I've been reading most recently: Philip Pullman's His Dark Materials trilogy. I read these books for the first time over five years ago, back in 2007 -- I didn't realize it was so long ago until I checked my blog, just now! I have always been meaning to read them again, but it wasn't until the girl I nanny for started reading The Golden Compass recently that I finally decided to do so. Another book I read over the summer at the same time as the girl I nanny for was Lois Lowry's The Willoughbys. This book is a little different than her popular award-winners, such as Number the Stars and The Giver, which are moving and thoughtful. Instead, The Willoughbys is more of a parody of classic British children's books about children in a family, such as Mary Poppins. I'm skipping back a bit now to a couple of books I read over the summer. Number the Stars was actually a reread for me -- perhaps the third or fourth time I've read it. (Once when I was in high school, at least once for my children's and YA lit classes in college, and then this summer.) The little girl I nanny for was supposed to read it over the summer, so I decided to read it, too. If I had to choose the worst book we've ever read for our sci-fi/fantasy book club, that book would have to be The Taking. Shortly before Christmas, my husband and I were in the mood to watch a musical, so we chose The Phantom of the Opera, the 2004 movie version of the Andrew Lloyd Weber musical. I've loved the story since I saw a made-for-TV version as a kid, but I especially loved the 2004 musical. It easily ranks as one of my all-time favorite movies. So of course, after seeing it again I was inspired to reread the book. I just wanted to wish all of my readers a happy New Year! How will you be spending the day? I'll be spending it with my nose buried in a book -- perhaps getting started on my reading list for 2013 (in the hopes of actually reading the books this year! ).